What is blockchain technology? Where is it used? And why is blockchain technology increasingly relevant in today’s world? This blog aims to answer these questions. Indeed, in a virtual world where not just shopping but even currency has gone digital, it is important to take a look at how the blockchain technology works. After all, it is the underlying technology that allows a cryptocurrency such as Bitcoin to work. Read on to know more about these concepts. How did blockchain come about? Blockchain is, in fact, the result of a need for increased security in systems; it was invented by a person/ organization named Satoshi Nakamoto (chances are it’s not the real name) in 2008 to serve as the public transaction ledger of the cryptocurrency - digital cash - bitcoin. Nakamoto published a paper explaining a novel approach to send money from sender to receiver directly without involving any financial intermediaries. Nakamoto called this revolutionary concept Bitcoin. Given that Bitcoin dwells on the use of several underlying concepts of cryptography, this method of exchanging money came to be known as cryptocurrency. The question remains: What is blockchain? Blockchain, originally called block chain (that’s two words, not one as it is known now), is a continuously growing list/ chain of blocks, which are linked and secured using cryptography. Now to understand what this statement means, we need to understand the following things: What is cryptography, what are these blocks, and how do the two come together? First let’s look at cryptography. Cryptography is the practice and study of techniques for secure communication in the presence of third parties, also called adversaries. So it involves creating, analyzing and executing protocols that prevent third parties or the public from reading private messages or messages not intended for them. They come into play wherever there is a need for information security, data confidentiality, data integrity, authentication. The next question then is: what are the blocks that make up this blockchain? 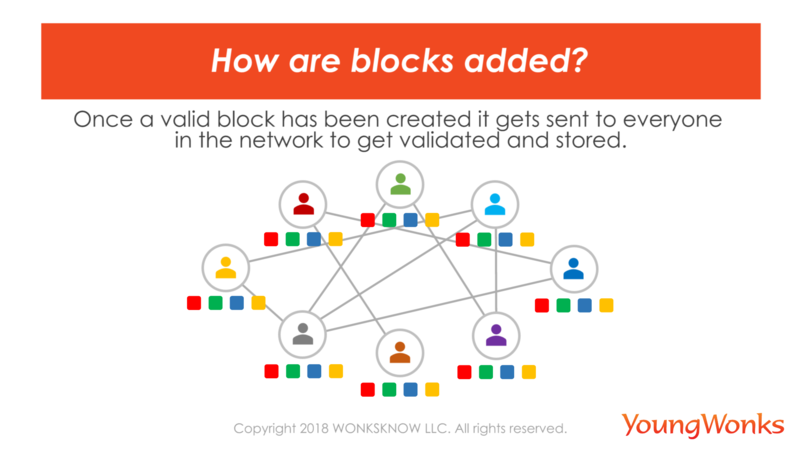 Now, each block typically is a record that’s connected cryptographically to a previous block. 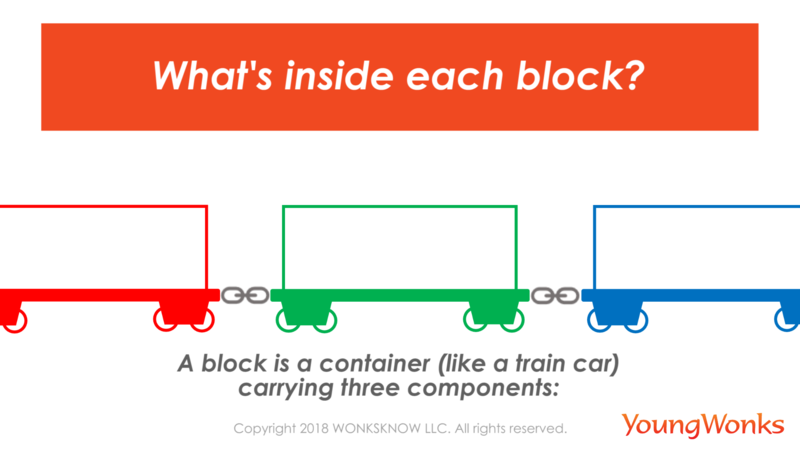 As shown here, each block in the blockchain is like a container or a train car with three components: 1) Data 2) Hash (information/ imprint from the previous block) and 3) Hash (information / imprint unique to the respective block). A blockchain can be quite long. The Bitcoin blockchain, for instance, has hundreds of thousands of blocks. 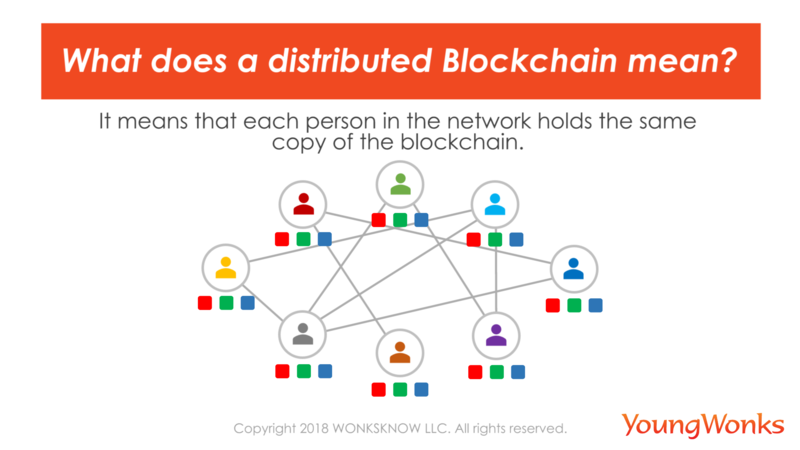 It is a distributed blockchain where each person in the network has the same copy of the blockchain. How are these blocks created? 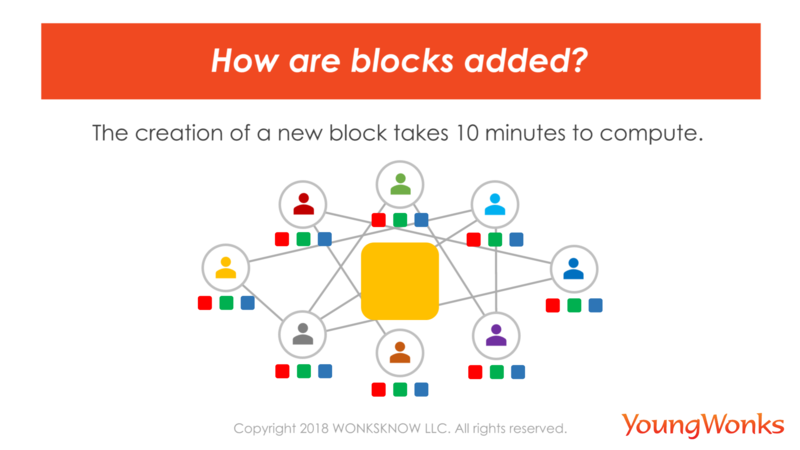 Typically, the creation of a new block takes around 10 minutes. Once it is created, it is sent to everyone in the network to be validated through consensus and stored. Mining is a record-keeping service done through the use of computer processing power; miners keep the blockchain consistent, complete, and unalterable by storing new transactions in new blocks, which are then sent across the network and verified/ validated by recipient nodes. Now if someone wishes to change a record or a block that has already been made, that record will become invalid as it won’t match the hash stored in the next block. In other words, each block has an effect on the remaining blocks here. In this fashion, blockchain allows users to safely store and easily verify information, so one person can’t cheat the system by editing / corrupting the records. The entire network is clued in and no one person can take it down. There’s also the element of timestamp here; which means that each block securely keeps track of the creation and modification time of the documents/ info within it. So the blockchain thus formed is an open, distributed, decentralized ledger that can record transactions between two or more parties efficiently and in a verifiable and permanent way. So who manages this chain or ledger of blocks? The answer is that it is typically managed by a peer-to-peer network of computers / users who collectively follow the protocol for communication and validating new blocks. To put it simply, once a block or record has been made, the data in it cannot be changed without impacting/ changing the subsequent blocks on that thread, this is where the consensus of the majority of the network comes in. It is a decentralized system because every record is maintained not just in one place but across a network of vast number of computers. This system has lots of advantages, including speed and security. All the other ledgers - think banking / any other company ledger - are maintained in one place, making them vulnerable to attack. We have seen companies like Home Depot and Target getting hacked because they had one central repository of information. Whereas in the case of the Bitcoin ledger or any ledger built using blockchain, the info - same info - is backed up on thousands of computers. It is a distributed ledger, with no central server; it’s too complex a system for anyone to hack. How is this blockchain concept being used today? As mentioned earlier, blockchain was introduced as the technology behind the cryptocurrency, Bitcoin. Bitcoin is the first digital currency to not need a trusted authority or central server - like a bank - to keep track of transactions and each bitcoin’s history / record of ownership, which in turn ensures each bitcoin has only one owner at a time. The entire network is doing that now; digital money is being moved by people in the network validating these bitcoin transactions and earning fees in the process. At the same time, the digital counterfeit money problem is also being tackled. It is important to add that blockchain has also helped Bitcoin on the speed front. Take for instance, you wish to send money to someone. You would typically do so via a bank transfer which would verify that transaction and it could take days for this to happen depending on the sum, the legal procedure and so on. But with blockchain, it’s vastly faster because no bank is involved. So what does the future look like with blockchain? Well, this is just the beginning. Going forward, blockchains can pave the way for companies entirely run by algorithms; for example, tracking billions of devices in the Internet of Things (IoT). It’s not surprising to see that the bitcoin design of blockchain has already gone on to inspire many other applications. In fact, since the blockchain is a database that is nearly impossible to hack or tamper with, the foolproof security (and greater efficiency and trust) on offer has made many companies from different industries - think Walmart, IBM, JP Morgan - sit up and take notice. So these companies are experimenting with blockchain to see if it can be used to potentially share and secure data and transactions in a reliable and easy to access fashion. 1. Important legal documents: Documents such as passports, marriage certificates, ownership deeds for land, any other property can be secured using blockchain. 2. Health / Medical Records: Health records/ profiles of individuals can be stored safely using blockchain which can ensure that they are not tampered with anyone else. 3. Fair elections: Blockchain can be used for creating a safe voting system that ensures that the same people do not vote twice. 4. Smart contracts: Blockchains can embed digital contracts which allow for digital payments to be made automatically in a trusted fashion. These contracts are called smart contracts; they help you exchange money, property, shares, or anything of value in a transparent, conflict-free way while avoiding the services of a middleman. Think of smart contracts as a vending machine. Typically, one goes to a lawyer or a notary, pay them, and wait while you get the document. With smart contracts, you simply put a bitcoin into the vending machine (i.e. ledger), and your escrow or driver’s license is deposited into your account. 5. These smart contracts can also be used to address macro-economic problems, especially related to distribution. Complex problems such as fractional ownership - for example, multiple farmers owning one tractor to bring down the costs per farmer or even equitable distribution of power across an area - can be tackled well using blockchain, as blockchain provides a framework where both maintaining records and carrying out financial transactions can be done securely. While blockchain seems to be an empowering technology as discussed above, one has to keep in mind that it’s still very early, no one yet knows what blockchain is really capable of. It would be worthwhile to also look at some of the common criticisms of blockchain technology. 1. Cryptocurrency Problems: Cryptocurrency, a product of blockchain, is said to be quite popular in illegal world, as it offers anonymity to the users and thus poses a tracking problem. This is also why many governments do not recognise it. It is well-known that a blockchain system is 51 percent vulnerable to attack, which means that if the majority is affected, the system will go down. 2. Complexity: Blockchain technology involves a completely new world. It is being argued that it has made cryptography more predictable. Moreover, the blockchain industry has a fair share of jargons that is not understood by most people and this is said to rob it of its trustworthiness. 3. Blockchain Bloat: Blockchain bloat is both a good and a bad thing. On one hand, it is a positive thing as it his means the number of transactions on a particular blockchain is increasing. More transactions means more people are using it, which is great for long-term adoption of any currency. It is the why Bitcoin and Ethereum blockchains are quickly growing in size compared to nearly all other cryptocurrencies in existence. But more transactions also means more data is transmitted on the blockchain in question. This can create a lot of problems when it comes to actively storing all of this data. Typically, this additional pressure also translates into higher transaction fees for transactions on the given network. 4. Safety Flaw: Because each individual in the Bitcoin network holds power over the resources on the blockchain, a lie can become a reality if more than half of the computer systems accept a lie as a truth. This flaw was pointed out by Satoshi Nakamoto when he launched Bitcoin which is known as 51% assault. And because of this, Bitcoin mining pools are monitored carefully by the validators, guaranteeing nobody unknowingly positive factors such community effect. 5. Human Error: Like all distributed systems, if a blockchain is used as a database, the information in the database needs to be of high quality. The data stored on a blockchain is not often trustworthy, so events need to be recorded accurately in the first place. 6. Large Energy Consumption: Even as the blockchain technology grows, more computing devices are needed to process even the smallest of digital transactions. The system will have to support thousands of transactions per second and the blockchain size will be overstuffed in no time. Imagine the energy consumed by an ever growing network of computers! While the younger and/ or smaller networks may not face the same problem, it is a fact that this is a major drawback of the blockchain technology.